Flagler Avenue has an eclectic array of choices for your evening. Many establishments have live music. Wander down the street to find one that fits your tastes. Your choices include Flagler Tavern, Traders, Peanuts, OM Bar and Chill Lounge, and The Grille at Riverview. Get a smoothie, coffee, or ice cream and stroll Flagler Ave. Check out a wide range of stores with everything from typical tourist shops with sea shells; surf shops; high end boutiques; art galleries; and gift shops. For more on Flagler, see the Local Info page. There are many events throughout the year. Click here to see a schedule. All of our beach condo's have fully equipped kitchens, however, if you prefer to dine out, there are many places around town. Breakers, Chases, and Toni & Joe's are the on ocean. The Grille at Riverview is on the river. 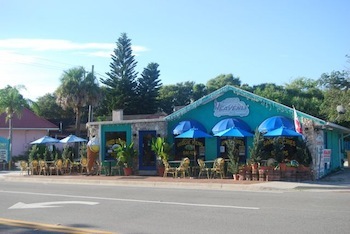 Beacon Restaurant - 416 Flagler Avenue. It is within walking distance from Coronado Towers. They serve standard American fare such pancakes and eggs. The Breakers - 518 Flagler Avenue, overlooking the beach, burgers. Chases - 3401 South Atlantic Avenue, overlooking the beach. Toni and Joe's - 309 Buenos Aires Street, overlooking the beach, very casual. © Coronado Towers 2012 All Rights Reserved.